Crisis is currently brewing in the affairs of Davido’s record label, HKN Gang. War began when the music star tweeted that his own blood is “hating on him” because of the newly signed artistes Mayorkun. 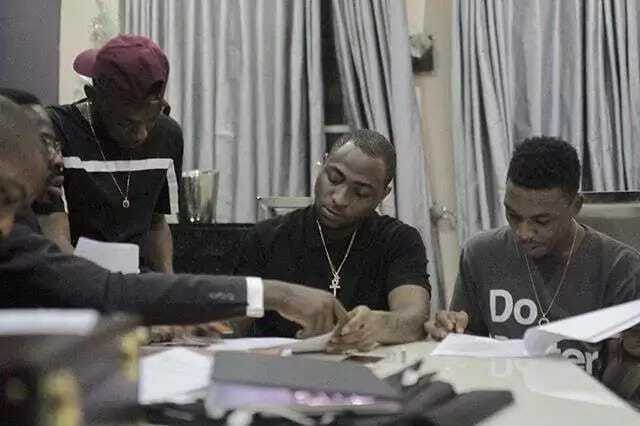 Davido has been more than excited since signing Mayorkun and Dremo to his personal imprint, Davido Worldwide Music, with both acts releasing a song each. While Mayorkun released Eleko with the video gathering over 1million views on YouTube, Dremo released Fela Back, sampled from Panda by Desiigner. We cannot ascertain who exactly Davido is referring to, accusing fingers are pointing towards Davido’s cousin and artiste under HKN, B-Red. Sources within the label who does not want to be mentioned because he is not authorized to speak on the matter confirmed that there is a little in-fight between Davido and B-Red. He however said everything is being done to settle the matter. Share on TwitterDavido has since been retweeting positive comments about the signing of Mayorkun and Dremo which have so far rated the two new acts far above other acts on the label.